This was my entry for the 2014 LumberJock Saw Swap (ErikF had inspired me to build a saw even before the saw swap began. 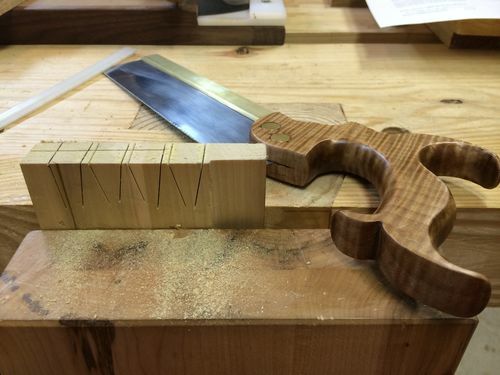 You should check out his blog tutorial on the tools for making your own saw from scratch.) I quickly discovered that building a handsaw almost entirely from scratch was completely possible with limited tools! I also discovered that it is addicting to build one, and I am already working on a second version for a co-worker. The 9” dovetail saw is made from 1095 high carbon steel plate that is filed at 15 ppi rip, purchased from Dominic at TGIAG.com. The brass back was machined from a bar of ¾” by ¼” C360 stock. I used my router table with a variable speed controller to cut the .020” slot using a slot cutting wheel and a jig, as well as the chamfers. I have had pretty good results this way. The split nut hardware was purchased from TGIAG.com as well. The handle is modeled after the Moses Eadon dovetail saw, and made from a scrap piece of highly figured maple with antique maple and walnut dye. I used lacquer for the finish and rubbed it out with #0000 steel wool. I think next time I would avoid the walnut dye (just use the antique maple) and use poly for a finish. It builds quicker and is more durable. Hey the saw is far from perfect, but it was a blast to make. For those of you who didn’t participate in the build, you really missed out! It was a lot of fun and educational. The best part, you can build a great saw from a kit and only shape the handle if you dont want to mess with machining. There are plenty of great resources for picking out the perfect handle template to boot. Go build one! Lovely looking saw. If it works half as good as it looks, then it’s clearly a winner! Nice job. Looks great! I’m tempted to try one myself. Great explanation on why building a saw is so empowering. Beautiful job on this saw. Great job, Norm. That piece of maple looks so good as a saw tote. Thank you for the kind words. The saw was a lot of fun to build. For those of you who are interested, I highly recommend you splurge and buy a kit right away! you may wish to test making a tote on the scrap first. Great looking saw, with very attractive handle. Nice job. Nice saw, I have been considering making one. I have a pretty long Priority list first. Awesome job. Slot cutter on the router – duh. Never thought about that. So how did you ensure that brass is on that plate super snug? Also – checked out your great bevel gauge from a while back. You said the plans were from a ShopNotes. Do you know which one? EDIT – nevermind, I see in the comments there it was #8. Thanks for a couple of inspirations. I can say that the pictures don’t do the saw justice. Looks better in person and it cuts pretty good too. Thanks for the saw Norm. It’s now my go to dovetail saw. COL Travis, Thanks for looking at my other projects. That there is a good looking saw, really like the curl in the maple. Welcome to the sweet addiction of saw making!